John Singer Sargent, an ambitious young American artist, in 1874 moved to Paris, where he soon enrolled in the studio of the famed portraitist Carolus-Duran. In 1877, he exhibited his first work at the Paris Salon and gradually began to make a name for himself; his portrait of his teacher Carolus-Duran was a particular success in the 1879 Salon (Ormond, Grove). Gautreau wears a black evening dress with a heart-shaped velvet bodice with a long pointed front and a black satin skirt. Her only adornments are the dress’s jeweled shoulder straps, her gold wedding band, and in her hair a diamond crescent, likely meant to evoke Diana, goddess of the hunt (Ormond 1998). She carries a black fan and has powdered her skin to achieve an artificially white complexion (Sidlauskas 2001). This sort of elegant evening dress would be worn in Paris; from Sargent’s sketches (Fig. 2) we can see the dress featured a modest bustle and ample train and that she paired it with low-heeled pumps. “The décolletage of the bodice doesn’t make contact with the bust, it seems to flee any contact with the flesh” (Houssaye, “Le Salon de 1884,” 589, quoted in Sidlauskas 27). The silhouette is a very fashionable small-waisted one, likely created by extensive boning in the bodice. 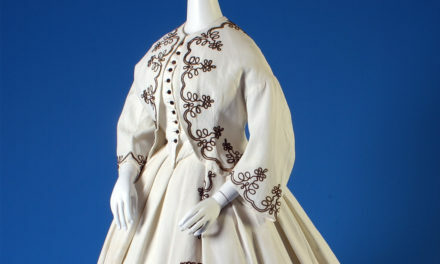 The dress design was undoubtedly a unique one created for Madame Gautreau herself, but by this period some of the sewing could have been done on machine. The black fan she holds could easily have been purchased at a department store. Fig. 11 – L. Mesnil (French). “La Mode au Théatre.” La Vie Moderne 6 (February 10, 1883): 89. Source: Author. FIg. 12 – L. Mesnil (French). “La Mode au Théatre.” La Vie Moderne 43 (October 27, 1883): 694. Source: Author. Fig. 13 – Les Modes Parisiennes (April 1, 1881), pl. 433. Source: Author, Bibliothèque nationale de France. “L’Événement reported her appearance in a dress of salmon-colored velvet…. Le Figaro raved about her dress of red velvet with a bodice of white satin, as did La Gazette Rose about her white satin dress with pearl netting…. In 1880, a reporter from The New York Herald saw her in France and filed a flowery story describing her magnificence” (57). In an 1883 column on the fashions worn by actresses on the stage (where many new styles debuted), the columnist for La Vie Moderne particularly praised that worn by Mlle Marie Magnier (Fig. 11) as the “most striking,” which in its ample décolletage, thin straps, pointed bodice, narrow-waisted columnar silhouette closely resembles Gautreau’s own dress (Magali 89). In a later column, a different columnist praised the “superb and magisterial toilette in black velvet, the whole art of which is its magnificent simplicity,” (Fig. 12) worn by Mlle Marthe Devozod, “the prettiest woman in Paris” (Venasque 694). The thin-strapped black velvet dress closely resembles the silhouette of the similarly trend-setting Mme Gautreau. Gautreau’s dress is a dramatic simplification of a style for pointed-front bodices and narrow straps that had been recently fashionable, without the tiers of lace or decorative swags of flowers one more typically finds, as in this Les Modes Parisiennes plate (Fig. 13). “Heavily boned, the cuirass had a plunging neckline and came to a deep, sharp point over the crotch. ‘Though the cuirass would have had some kind of lining to soak up sweat, the model would not have been wearing any underwear,’ said Valerie Steele, director of the museum at the Fashion Institute of Technology, and that would have been scandalous” (Dilberto, New York Times). The portrait’s poor reception at the 1884 Paris Salon soon prompted Sargent to leave France to seek clients instead in England, where he found great success. By 1891, Gautreau had clearly changed her mind about the portrait as she commissioned a similar one from French artist Gustave Courtois that featured the same profile pose and daringly dropped shoulder strap (Fig. 10). Madame X remains Sargent’s most famous portrait (Ormond, Grove) and its place in the collection of the Metropolitan Museum has kept it in the public eye since its acquisition in 1916. It has even inspired two historical novelizations, Strapless: John Singer Sargent and the Fall of Madame X by Deborah Davis and I am Madame X by Gioia Dilberto (both 2004). Vogue and Julianne Moore (photographed by Peter Lindbergh in 2008 – Fig. 17) in Harper’s Bazaar. Notably neither version includes the jeweled straps (fallen or otherwise). The heart-shaped neckline, small waist, and body-clinging silhouette has been echoed by a number of more contemporary designers, from Olivier Theyskens for Rochas in 2005 (Fig. 18) to Dior dressing Charlize Theron in 2014 for the Oscars (Fig. 19). Moreover, the portrait has frequently appeared in popular culture–for example, facing off against a Picasso on the cover of the New Yorker (Fig. 20). Diagram of referenced dress features. Source: Author. Davis, Deborah. Strapless: John Singer Sargent and the Fall of Madame X. New York: Tarcher, 2004. Dilberto, Gioia. “Sargent’s Muses: Was Madame X Actually a Mister?” New York Times, May 18, 2003. Herdrich, Stephanie L., and H. Barbara Weinberg. “John Singer Sargent in The Metropolitan Museum of Art.” The Metropolitan Museum of Art Bulletin 57, no. 4 (Spring 2000). Ormond, Richard, and Elaine Kilmurray. “Madame X or Madame Gautreau.” In John Singer Sargent: The Early Portraits. Complete Paintings, vol. 1, 112-115. New Haven: Yale University Press, 1998. Ormond, Richard. “Sargent, John Singer.” Grove Art Online. Oxford Art Online. Oxford University Press, accessed October 3, 2015, http://www.oxfordartonline.com/subscriber/article/grove/art/T076043 (subscription required). Sidlauskas, Susan. “Painting Skin: John Singer Sargent’s ‘Madame X. '” American Art 15, no. 3 (Autumn 2001): 8-33. Stable URL: http://www.jstor.org/stable/3109402 (subscription required). Weinberg, H. Barbara. “John Singer Sargent (1856–1925)”. Heilbrunn Timeline of Art History. New York: The Metropolitan Museum of Art, 2000–. http://www.metmuseum.org/toah/hd/sarg/hd_sarg.htm (October 2004).